Smoked Salmon. It’s not something you’d usually make at home, right? Well now is the time to throw that notion right out the window and GET YOUR SMOKED SALMON ON at home! It’s actually surprisingly quite easy and SOOOO delicious! Plus it’s a somewhat fancy trick you can do for a dinner party to impress friends hehe ;). Salmon (thus, smoked salmon) is a fabulous source of long-chain omega-3 fatty acids, protein, potassium, selenium, vitamin B12 and so many more goodies! Here, I served the salmon on top of broccolini and zucchini & carrot noodles in a tamari/ginger/garlic sauce. But feel free to serve with other veggies as you prefer! Line the bottom of a large roasting pan with aluminium foil. Place rice, tea, and sugar in a bowl and toss to combine. Evenly spread rice mixture over the aluminium foil. Generously oil a wire rack and place it over the top of the rice mixture. Place the salmon on the wire rack, skin side down. Cover the entire roasting pan with foil, minimising places where air can escape. Place the pan over high heat on your stove top, or on the BBQ. Smoke for 4-5 minutes, remove from heat and discard foil. (Best to remove the foil outdoors as smoke will escape and you might set off your smoke alarm if you do it inside). Optional – if you like a crispy skin, you can grill the skin side of your smoked salmon on a hot pan to crisp it up before serving. Place ginger, garlic, lemon juice, tamari in a jar and shake to combine. Place julienned carrot and zucchini in a bowl and add half the dressing from the jar. Set aside to cure. In a fry pan over medium heat, sauté the broccolini in a little EVOO and the remaining dressing from the jar until just cooked. 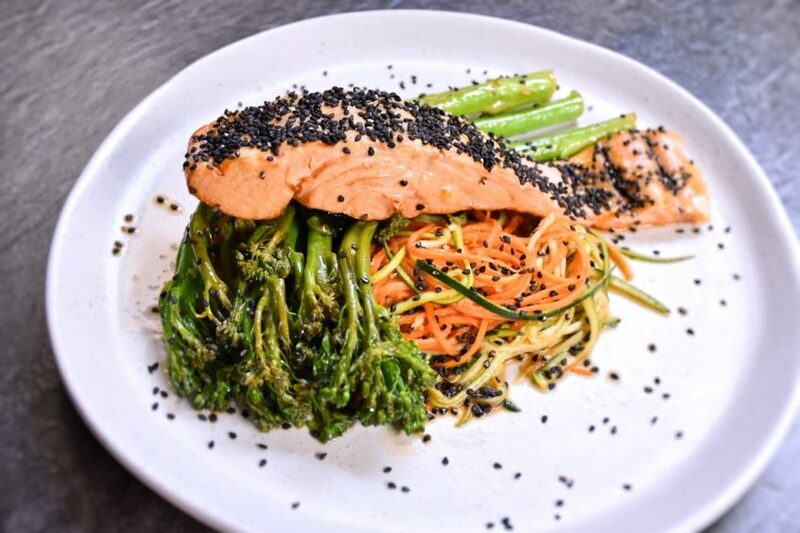 To serve, place half the carrot/zucchini noodle mixture on a plate, top with half the broccolini and one smoked salmon fillet (repeat for the second plate). Garnish with sesame seeds.